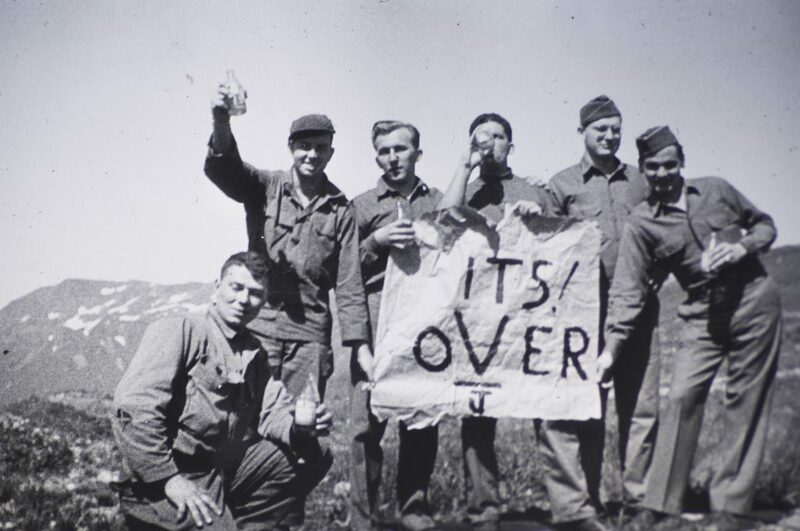 When my wife Christina and I were cleaning out her late father’s garage, we came across two cases of Kodachrome slides that included nighttime shots of downtown Minneapolis in the 1940s and 1950s, pictures of daily life in nearby Hutchinson, Minnesota, and some World War II photographs, like this one of a group of soldiers celebrating on Attu Island in Alaska on V-J Day. We determined that the photographs were taken by David Tewes of Hutchinson, Minnesota, Christina’s first cousin twice removed. He died in 1991, and her dad had likely come into possession of the slides then. They sat untouched in his garage attic for twenty-five years. I wanted to scan the slides so they could be preserved and shared, but we had to get them back home to Oregon first. Fun fact: if you pack cases of slides in your carry-on luggage, your bag will get special attention from a TSA agent since the X-ray machine can’t see through the slide case. Internet research showed me that there are generally two ways to digitize old slides: either use a slide scanner, or get a macro lens and take a photo of each slide at 1:1 magnification. 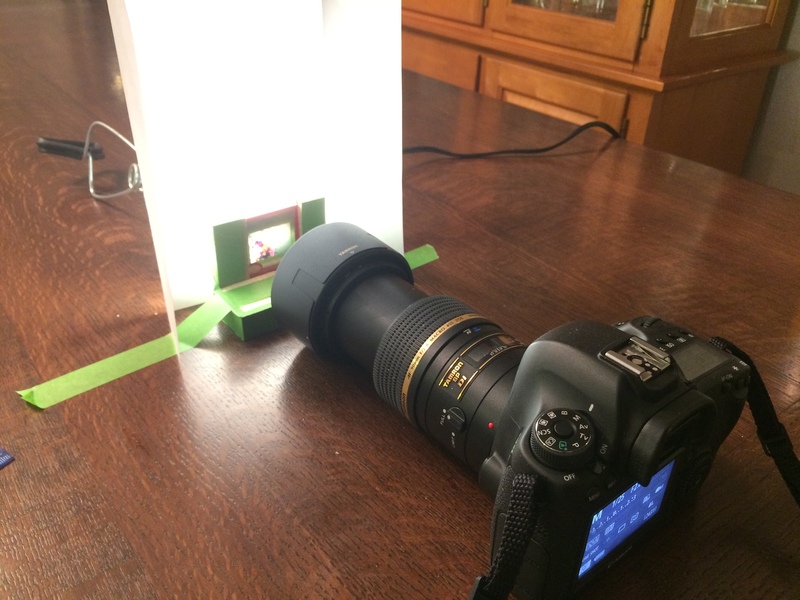 I couldn’t find a slide scanner in my price range, so I paid $40 to rent a macro lens from LensRentals.com and set up a rig for “scanning” all of the slides. 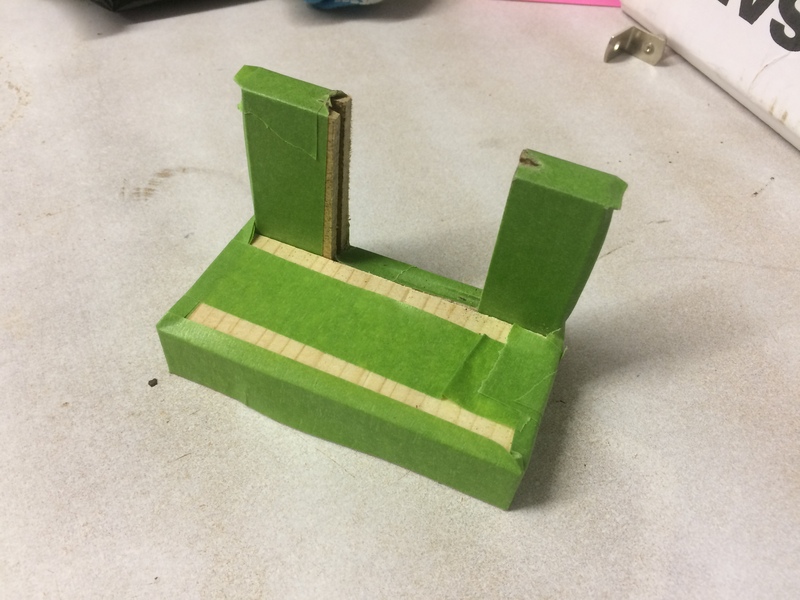 The slide holder is three pieces of hardboard sandwiched together with a cut-out in the middle for the slide to fit into. I back-lit each slide with a very bright lamp, and I added a paper shade around the slide to prevent my eyes from getting burn-in from the lamp bulb. Here’s an example of what one of the slide photos looks like, overexposed so you can see the labeling that David added on each slide. I took four photos of each slide at decreasing shutter speeds (in raw format) and then chose the best one. I cropped and captioned all of the photos in iPhoto and organized them into events matching how David had organized them in his slide cases. In order to get the slides from iPhoto to the Web, I wrote a script that uploads an entire iPhoto library to a WordPress website. It creates a post for each event and then adds all of the event’s photos to a gallery in the post. I will publish a standalone post soon with details about that script. The result of all this work is DavidTewes.com. 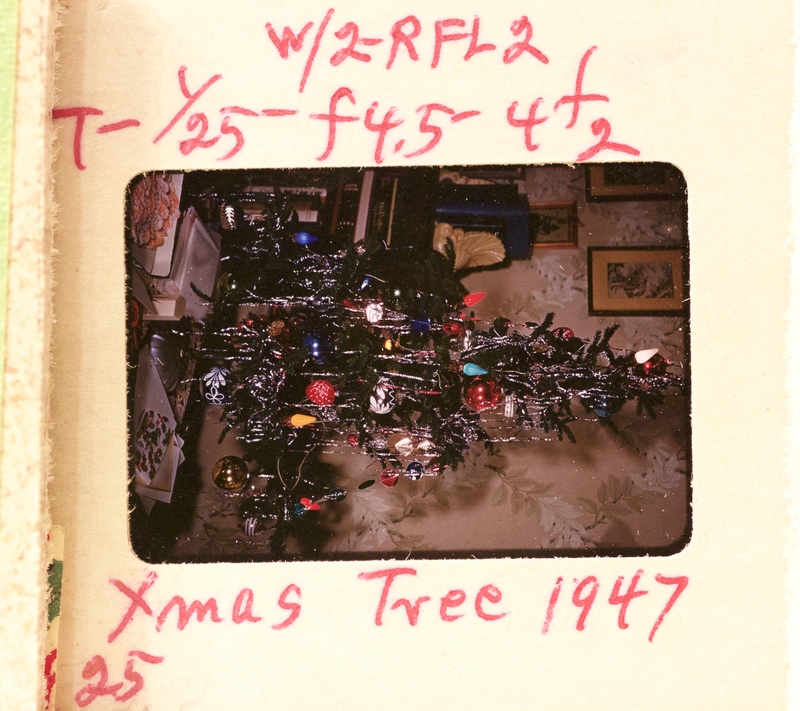 It contains 650 photos organized into 51 posts, with dates ranging between 1944 and 1955. All of the photos are licensed under the Creative Commons – Attribution license, meaning that they may be used for any purpose (commercial or non-commercial) and derivative works may be produced, as long as David is credited as the photographer. If I understand U.S. copyright law, the photos will enter public domain on January 1, 2062. Some of my favorite albums are Attu, Alaska, This is Minneapolis, and Santa Monica. In each of those albums (and in most of the others), David created a title card, sort of like a scrapbook page that he photographed to introduce the photos. 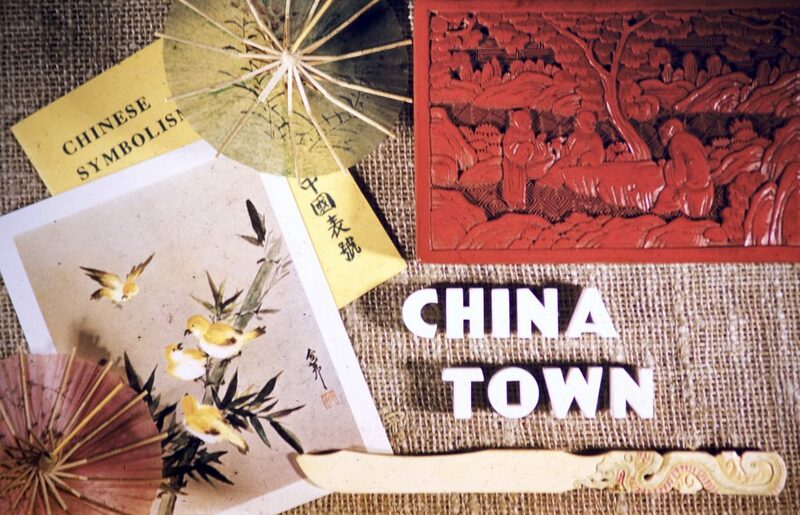 For example, here’s the title card for the photos from his trip to China Town. There were 81 title slides; you can view them all here. Although some of the slides were labeled with a date, many were not. For those, I’ve estimated a date but marked them as such. If you’d like to help narrow down the dates for any of those photos, you can see them all here. Leave a comment on the photo or on the photo gallery post with any information you have, like this comment on a photo of cars from the Minneapolis Municipal Gardens. 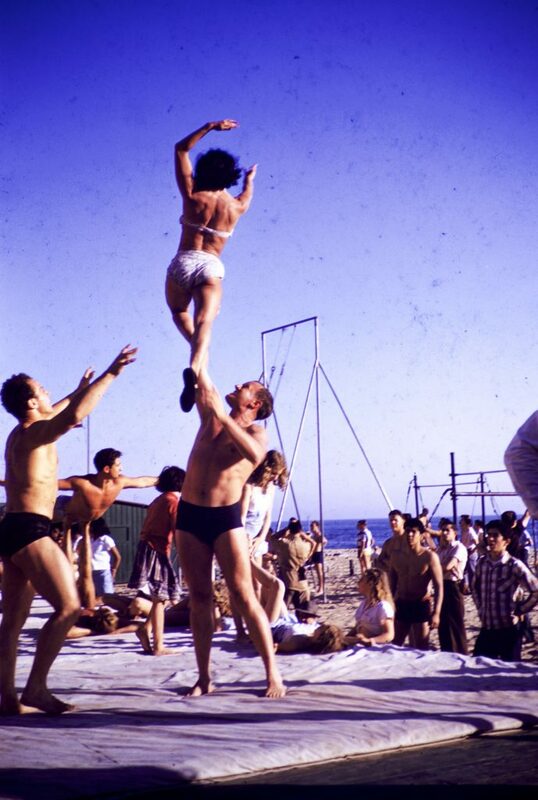 My favorite photo out of all of them is this shot of feats of strength at Muscle Beach when it was still in Santa Monica. What’s yours? Love the low tech use of cardboard. I will get a light box and try it. Will not be expert on creating a slide holder. Thanks very much for taking the trouble to describe the method. Rigged up something similar last weekend to bring old family slides back to life with good results. I am amazed at how good the color is, both yours and the original slides. What a great job. How do you set exposure, and if manually, do you readjust for each image? What ISO do you use. How did you set white balance. Do you use auto focus? Do you lock the mirror up? How do you set exposure, and if manually, do you readjust for each image? I took four shot of each slide with the aperture set at f/2.8, adjusting shutter speed (manually) so that the light meter on the camera read -1, 0, 1, and about 1.5. Then afterwards, I chose the shot that looked the best. What ISO do you use. All of the shots were taken with ISO set to 100. How did you set white balance. I set the white balance to Fluorescent, as that appeared to give the best approximation of the real-world colors in the digital photos. Do you use auto focus? Do you lock the mirror up? No, I wasn’t aware of this feature, but as I read about it now, it looks like it would have been useful to decrease the chance of camera movement while I took all of the shots. Hi Christopher, you say that some pictures was taken in WW2, do you know where was taken? Could be Italy? If the case, could you share them? I believe all of the WWII photos were taken in Alaska.